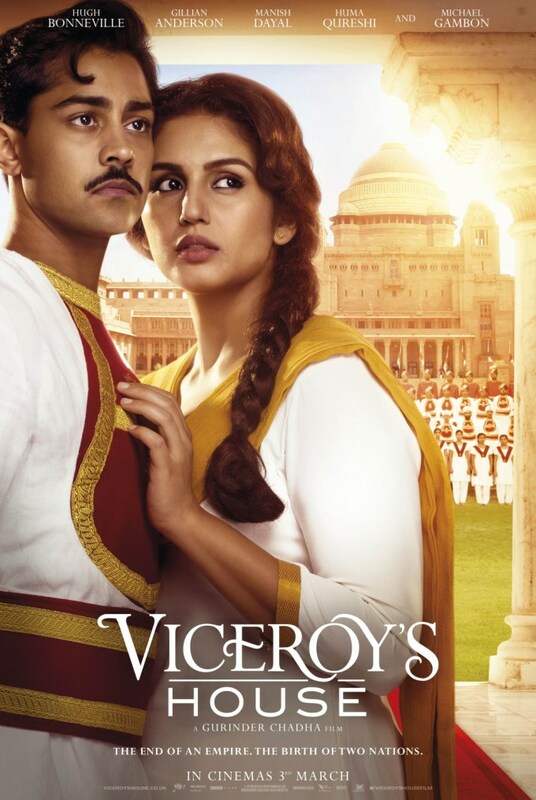 Synopsis: Viceroy’s House in Delhi was the home of the British rulers of India. After 300 years, that rule was coming to an end. For 6 months in 1947, Lord Mountbatten (played by Hugh Bonneville), great grandson of Queen Victoria, assumed the post of the last Viceroy, charged with handing India back to its people. Released to coincide with the 70th anniversary of the independence of India and the founding of Pakistan, Director Gurinder Chadha [Bend it Like Beckham (2002); Bhaji on the Beach (1993)] has dedicated the lavish Viceroy’s House to the memory of her aunt and grandmother who were among the 14 million displaced in the violence and bloodshed of the end of an empire and the birth of two nations. Although infused with this strong personal element, the film is a timely re-visiting of the final months of British rule in India and the complicated politics of partition. Chadha has made a film concentrating on the effect on ordinary people within a large-scale populist political drama. A sumptuous large scale production with many extras, luxurious costumes and beautiful mise-en-scene in vibrant real-life locations, it is a visual feast with cinematography from Ben Smithard. Upstairs in the Viceroy’s House – a palace so vast and magnificent that it makes Buckingham Palace look like a bungalow – Lord Mountbatten (Hugh Bonneville in patrician Downton Abbey mode, radiating old-fashioned British decency) has been charged with administering the independence and partition of India, unaware of Churchill’s hidden agenda back home to secure oil futures for the British economy. Gillian Anderson shines as Lady Edwina Mountbatten, presented here as a serious, philanthropic, purposeful woman with no hint of flirtatious socialite. As the Indian political elite – Nehru (Tanveer Ghani), Jinnah (Denzil Smith) and Gandhi (Neeraj Kabi) – converge on the House to wrangle over the birth of independent India, conflict erupts. A decision is taken to divide the country and create a new Muslim homeland: Pakistan. It is a decision whose consequences reverberate to this day. Downstairs among the 500 Hindu, Muslim and Sikh servants, the social impact of this divide is told through the lens of a Romeo and Juliet style love story between Jeet (Manish Dayal) and Aalia (Huma Qureshi). Aalia has already been promised by her blind father (played by the redoubtable Om Puri in one of his final roles before his death earlier this year) to another man, a Muslim soldier who has been fighting for the British in the war. Ewart, a severe Scottish butler-type (David Hayman) snaps at servants when tensions are brewing and cries of ‘Pakistan Zindabad’ are heard. His wisecrack “It’s worse than Glasgow on a Saturday night” plays on stereotypes to create a rare moment of humour. A lush evocative musical score by A.R. Rahman enhances the narrative and period setting. Viceroy’s House has echoes of Paul Scott’s 1977 novel Staying On in its final scenes with the Mountbattens philanthropically vowing to ‘Stay on’.